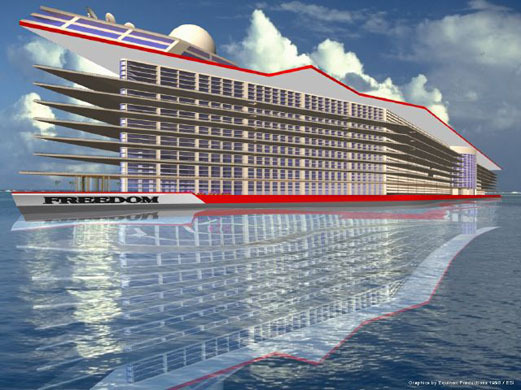 Freedom Ship was a floating city project initially proposed in the late 1990s. It was so named because of the "free" international lifestyle facilitated by a mobile ocean colony, though the project would not have been a conventional ship, but rather a series of linked barges. The Freedom Ship project envisioned a 1,317m (0.818 miles)-long integrated city with condominium housing for 50,000 people, an airstrip to accommodate turboprop aircraft, duty-free shopping and other facilities, large enough to require rapid transit. The complex would circumnavigate the globe continuously, stopping regularly at ports of call.